ADVANCES ARE MADE BY PUSHING LIMITS. using the human body as our only source of power, we are forced to approach engineering challenges from a new perspective. extreme efficiency and unconventional solutions become the norm. Since 2010 our passionate teams have succeeded in building the world's first flapping wing aircraft ("Snowbird") the Sikorsky-Prize-winning human-powered helicopter ("Atlas") and the fastest human-powered vehicle on earth ("Eta"). On June 13, 2013, Aerovelo’s human-powered helicopter Atlas won the AHS Igor I. Sikorsky Challenge and its $250,000 prize. During the record-­breaking 64 second flight, Atlas reached a height of 3.3 metres. The Igor I. Sikorsky Human-Powered Helicopter Competition, which had gone unclaimed for 33 years, represents the third largest monetary prize in aviation history. The monumental feat required a human to hover to an altitude of 3 metres under his/her own power, and to remain aloft for at least 1 minute. The challenge is test a of ingenuity, athleticism and determination. After the winning the Sikorsky Prize, the team went on to set both the women's and men's helicopter endurance records, as well as quadrupling the total number of people to ever fly a human-powered helicopter, when the entire engineering team got their chance to fly Atlas on September 24th, 2013. The key to success on Atlas was to start from first principles and to be free of unnecessary constraints. We designed Atlas as big as it had to be to win the prize, and then figured out where we could fly it. 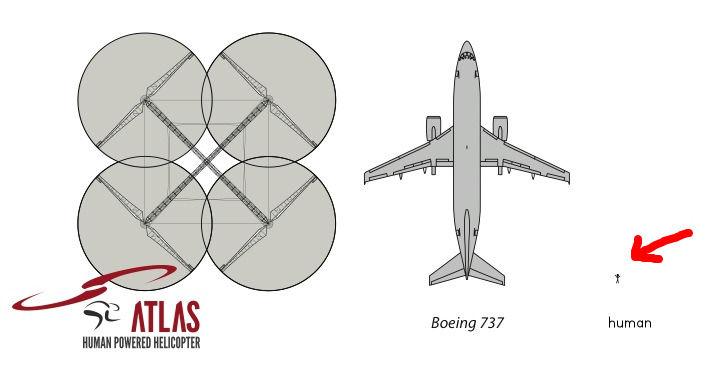 Atlas turned out to be twice as big as anything that had been built before - it was bigger than most commercial aircraft - and much, MUCH, bigger than the human inside it. Aerovelo Inc., founded by U of T Engineering alumni Todd Reichert (EngSci 0T5, AeroE PhD 1T1), and Cameron Robertson (EngSci 0T8, MASc 0T9), have made history by winning the $250,000 AHS Igor I. Sikorsky Human-Powered Helicopter Prize, on June 13, 2013.